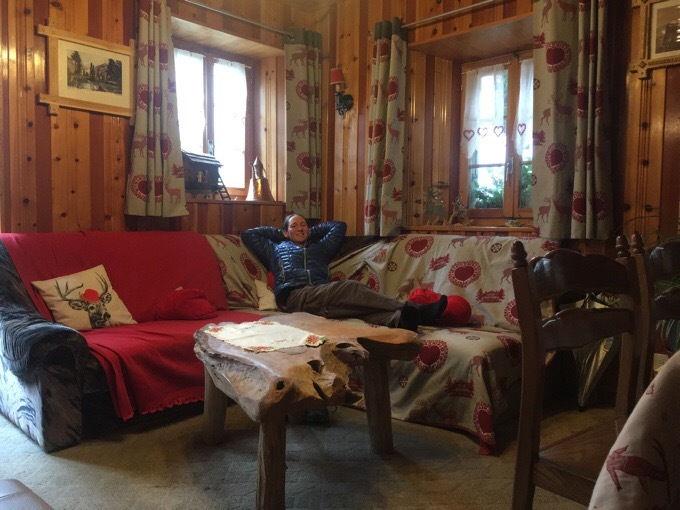 I was sooo glad I stayed in the cozy accommodations through Hotel du Glacier in Arolla last night. I slept in and by the time I stepped out at 8am, it was already beginning to rain. I was given an indulgent breakfast that I totally didn’t expect. Usually, when breakfast is included in the stay, it’s bread and jam. This was platters of unlimited french toast (oddly served cold, but I’ll take it! ), soft boiled eggs, ham, bread, jam, juice, my choice of fresh fruit (watermelon), and TWO hot chocolates. I sat there over an hour taking advantage of this. The staff here are really kind and I like it a lot. However, the slow wifi was killing me! I’m assuming everyone in town has the same slow wifi, so I don’t blame them. We’re in an amazing mountain setting, and I’m impressed they have wifi at all. It wasn’t until 2pm that I got the blog written and posted (photos took a really long time to load) and caught up on my correspondence. I spent the whole day pretty much on my own in the little lounge at the main building of the hotel since there isn’t wifi in the dorm rooms. I pushed off planning my upcoming days for two reasons. One is that I just can’t stand planning, and two is that I had a feeling it wasn’t good news…I looked up the weather, and was right. I have two more weeks before I fly home, and my thought was that this cold front would pass. Even if I needed to take some days to maybe go somewhere warmer and then return in a week, I only have 4-5 days left on the Walker’s Haute Route to get to the end in Zermatt. I figured I’d get a handful of days, even spaced out, in the next two weeks. No, unfortunately, it was not to be. 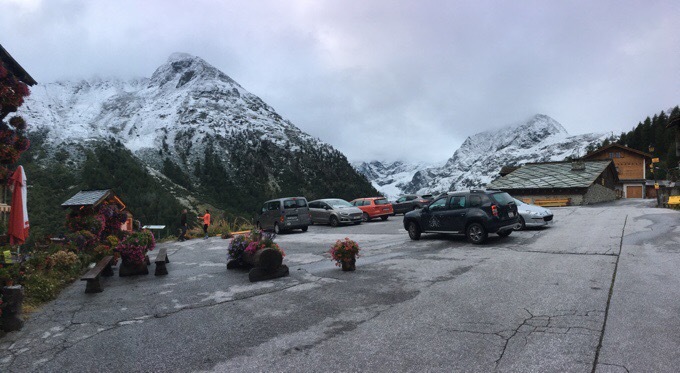 Switzerland has skipped fall and jumped right to winter. The forecast for the next two weeks has rain or snow most days and temps near or well below freezing. We’re talking days at 17F/-8C. I’m hiking among the highest places in Europe, and it’s just not going to be enjoyable or even safe with the conditions. I have said I hadn’t expected to fit the Haute Route in this year, and I got half of it with great weather and views. I want the other half to be just as great and scenic. I am happy to go out on a high note this summer and return to do the other half in the future. I then started looking at options of how to spend my next two weeks. The GR20 came to mind, but honestly, I’m just not in the mood for it right now. I even thought about non-hiking ventures like Barcelona. With everything I thought of, nothing was pulling me as much as the thought of being HOME. I’ve been traveling so much this past year that I’ve only been home for for about 2.5 months over the last 15 months. I miss home and am ready to return to the comfort of my routine there. I knew it was a 50/50 shot to hike in Switzerland in September. 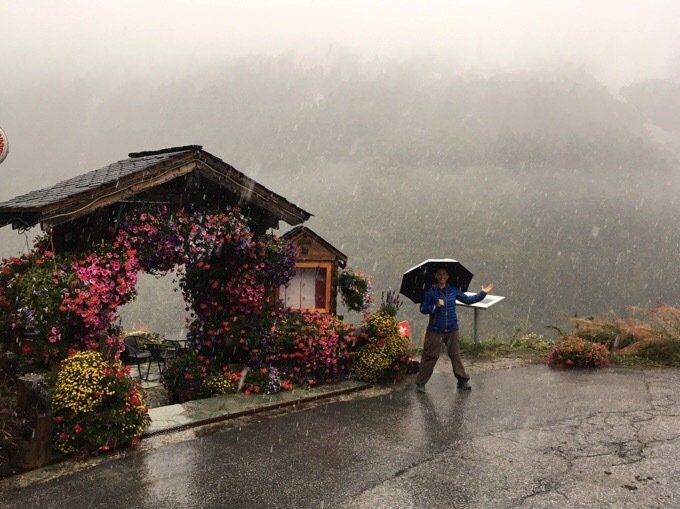 I know people who have hiked in the Swiss Alps this time of year, and had hit weather. It can go either way. I shifted my mindset from staying here two weeks to returning home and working. Crazy as it sounds, I really want to go home and get back to work. School has started and I’d normally be working by now. It’s time. I spent the rest of the day with the slow wifi (that got even slower as more guests arrived) arranging details to fly home in three days. I’ll take tomorrow to get to Chamonix, where I left some things in storage at the hostel, and possibly get to Paris. I have some things to take care of and am not sure about transportation availability, so I put a buffer day in there before I fly out. I’m surprisingly peaceful about all of this. I think that’s huge for me. There’s no doubt in this decision. As the day wore on, it even snowed quite a bit. At moments, I could see it coating the mountains through the fog. There should be a good view of it tomorrow. Having things not go as planned can really annoy me sometimes. I didn’t wake up this morning thinking I’d be heading home, but I am and I’m pretty satisfied with that. It’s what’s calling me, and I’m going with my gut. As soon as I made the decision to go home, a wave of calm came over me. I feel really happy and relaxed at home and have missed it. As I said, it’s time. A photo of the snow the next morning. Haha, only joking. Sounds like you’ve made a good decision to go home. I often leave my plans to the last minute and tend to agonise over what to do next, but once I have things finally booked, then I experience that same wave of calmness. Haha, I knew someone would do it! Great rain pic with the flowers…welcome home…almost. Ha! This post has caught me out, rather, I was not expecting that. 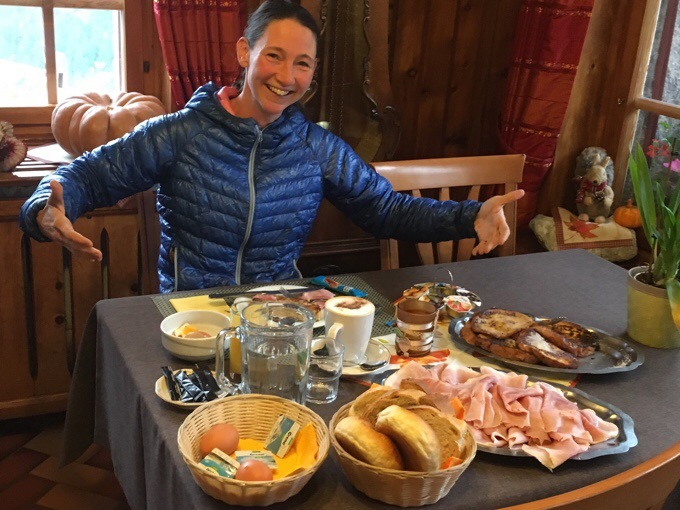 But you have had a totally successful time in Europe, Erin, you have given both the Pyrenees and the Alps a really good seeing to.. so if you feel it is time to go home now, then so it is, absolutely. Also the Coast to Coast, Erin – and the Southern Upland Way might be your sort of thing, quite remote, lots of wild camping required with the possibility of a trip to Edinburgh after…and/or the West Highland Way with the Great Glen Way tacked on afterwards! Oh, Erin – it has been a spectacular adventure. Glad to hear you went with your gut. Love the picture with your umbrella, the snow and the flowers. I look forward to reading your recap and wish you safe travels home. Erin, this is a huge step. Congrats on the hike, but most of all congrats for not freaking out. I’m proud of you. A good call. I’m sure you feel calm now and excited to be home. Sorry I just missed you in Portland. Happy home coming. Erin, you made a great decision. Sounds like you are getting wiser with age. Your sharing of this trip has been outstanding and I really appreciate it, but as you say, it is now time to go home and live the rest of your life. Save travels and I look forward to Your next post. Looks like decent quality food as well. Life is often better outside these united States. Travel safe and secure. We will be awaiting your next post, in your own time. Great decision and a big step to be able to step back and follow your gut! Good work Wired! Safe travels home and thanks for taking us all along this summer as always. Have a safe flight home. Glad that you want to come back to good old Europe. Hope that you reached Norwegian Air ? Oh that was YOU?! Haha! The wifi was so bad it was cutting out and I figured I dialed the US Airline or something. Sorry Remo! Next Spring I recommend the South West Coastal Path (I can give you my books) or the Wales Coastal path, each 700 miles. Hiking alone gets to be lonely, even when meeting new or old friends. It can also be too risky. It’s funny because the more I hike solo, the more I get hooked on the freedom of the solo hiking! Wales won’t happen next year, but I know who to turn to when I do go! Still, looks like a beautiful finale to an epic summer. I like that we both finished about the same time! “As soon as I made the decision to go home, a wave of calm came over me.” I’m so proud of you Erin. I walked and grown with you since the PCT and the pleasure has been all mine. Glad to see Griggs posting. I hope you had a great finish on the CDT or will soon. OK, I see Griggs finished the CDT yesterday. Erin, please tell Griggs congrats from Warren. Wow, no Zero’s! Congratulations on your epic experience. Loved experiencing it with you. You accomplished more then you expected even tho you cut the added bit a little short. Portland will welcome you!! Always go with your gut. When you feel that peace, you know you made the right decision. Finishing on a high note, not pushing through misery just to say you did it. You know and we all know you could survive, but why? Once again, it has been such a pleasure folloiwing along. Wired, your European experience has been a phenomenal finale to an incredible 15 months. Your journey has been lovely and intense and challenging and diverse and enjoyable. Thank you for all those extra hours you take to post. I’ve felt that same wave of calmness after making a decision to not do something I had planned to do. When I feel that, I know it was the right choice. It’s nice in Portland/Vancouver right now, and I know you’ll enjoy being home. Congratulations Erin on another epic journey! I’ve loved this hike, and as usual your amazing photos and commentary. I’m in awe ? Glad you went with your gut and made the right decision for you, although I’ll miss your blog. Would love to follow you in my homeland Wales , you could walk in the Foot steps of Bill Bryson! You wouldn’t want to lose your umbrella there though ? Congrats on another amazing set of hiking adventures! I hope you have a good homecoming. Thank you so much Erin for including us on your journeys. I really have loved hearing about your French adventures as it is a place I plan to do a lot more wandering. It is such a lovely part of my day to wake up with a hot cup of tea and your fantastic stories and photos from around the world. Like others I will miss it but I still have a wealth of “back episodes” I missed to keep me entertained until your next adventure! Have a wonderful time back home, enjoy giving your sister and those gorgeous nephews big cuddles! Haha, you’ll love to binge read those old entries! It really brings it all together.